Directions: Write the episode mission below in the "Episode Mission" box of your Episode 4 Lesson Chronicles. I can tell you the part that Henry Frick played in building America. Directions: Read the Episode 4 Overview below. Carnegie hires Henry Frick to help him achieve his goal of dominating the steel industry and besting Rockefeller. The partnership seems promising, but Frick is pushing workers to a breaking point. Meanwhile, the Johnstown Flood of 1889 leaves 2,000 people dead, and Carnegie’s South Fork Fishing & Hunting Club faces blame. Worker unrest culminates in a massive strike at the Homestead Steel plant in 1892. Violence ensues when Frick calls in the Pinkerton security agency. The strike is a major turning point in American labor history, showing how workers would fight for fair wages and conditions when faced with injustice. Carnegie is determined to make up for these scars on his reputation. Directions: Write the vocabulary words and terms below in the "Vocabulary and Terms" box of your Episode 1 Lesson Chronicles. Directions: While Watching Episode 4: Blood IS Spilled, answer each of the following questions in the "Episode Guide" section of your Episode 4 Lesson Chronicles. You should read one question ahead so that you are always listening for the answers you need. If you are absent, you can view the Episode by clicking on the link below. When the water stops, more than _____________________ people lie dead. The Johnstown Flood is the worst man-made disaster in the United States prior to _______________. The flood is the first major peacetime relief effort of the recently formed _____________________. The incident forever changes Andrew Carnegie, who feels a sense of _____________________ for the disaster, unlike many of his fellow club members. Carnegie builds _______________________. It is New York's new home for the performing arts and for high society to rub elbows. With plans to make it the largest in his steel making empire. Carnegie invests millions retooling the plant to turn out more structural steel than any other mill of its size. ___________________ is a true modern marvel. Carnegie knew that to stay profitable. He had to keep costs low and the only way to keep costs low was to reduce _______________ and increase ______________. Carnegie turns to his chairman to do the dirty work. Henry Frick has never been concerned with what people think of his methods. He's about one thing _______________. Frick decided that the only way to keep the plant running efficiently was with a __________ hour day, ___________ days a week. When Carnegie was building his empire, obviously there were no ___________________, it was a free for all and looking back it seems horrific in a lot of different ways that workers were taken advantage of. ________________ are relatively new in America and Frick isn't about to let them take root on his watch. In case of a ___________________, Frick will have a stockpile of finished steel. Accidents on the plant floor keep multiplying until one proves ____________. Frick tells workers that Carnegie Steel won't _________________ and conditions won't be improving. 2,000 steel workers ___________________ the front of the plant to prevent Frick from bringing in replacements. Under pressure to quell the revolt, Frick brings in the _________________- A mercenary army capable of outgunning the U.S.Military. When the fighting stops, __________Carnegie Steel workers lie dead, while countless others sustain severe injuries. Carnegie extends his stay in Scotland, hoping the distance will allow the _________________________ to blow over. A new group is emerging, calling themselves the ________________. Known for their violent tactics, they are beginning to strike out whenever and wherever they see injustice. Directions: After Watching Episode 4: Blood Is Spilled, you will participate in a small group discussion. 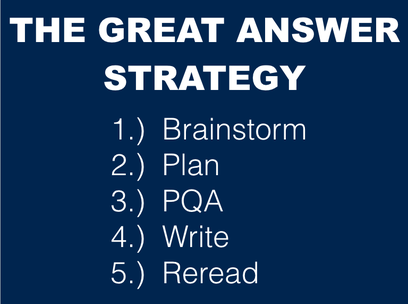 In your groups, you will use our "Great Answer Strategy" to discuss and answer the following questions in your Episode 4 Lesson Chronicles. 1.) What caused the Johnstown Flood? What were some of the positive and negative outcomes of this disaster? 2.) Do you think Henry Frick was a good leader? Why or Why not? 3.) Why did workers strike at the Homestead Steel Plant? Why was the strike an important turning point in American history? ​4.) Do you think Andrew Carnegie was responsible for the Johnstown Flood and the Homestead Steel Strike? Why or why not? Directions: Read the two accounts of the Homestead Steel Strike by Emma Goldman and Henry Frick. Answer the questions in the Episode 4 Investigation Box of your Episode 4 Chronicles. Then compare and contrast their accounts of the story. It was May 1892. Trouble had broken out between the Carnegie Steel Company and its workers, organized in the Amalgamated Association of Iron and Steel Workers. Amalgamated Association was one of the biggest and most efficient unions in the country, consisting mostly of strong Americans, men of decision and grit, who stood up for their rights. The Carnegie Company, on the other hand, was a powerful corporation. Andrew Carnegie, its president, had turned over management to Henry Clay Frick, a man known for his hatred of unions and workers. ​The Carnegie Company enjoyed great wealth and prosperity. Wages were arranged between the company and the union, according to a sliding scale based on the current market price of steel products. The steel-workers declared that they were ready to take up the challenge of Frick: they would insist on their right to organize and to deal collectively with their employers. Their tone was manly, ringing with the spirit of their rebellious forebears of the Revolutionary War. Andrew Carnegie decided to abolish the sliding scale. The company would make no more agreements with the Amalgamated Association. In fact, he would not recognize the union at all. Then, he closed the mills. It was an open declaration of war. Then the news flashed across the country of the slaughter of steel- workers by Pinkertons. In the dead of night, Frick sent a boat packed with strike-breakers and heavily armed Pinkerton thugs to the mill. The workers stationed themselves along the shore, determined to drive back Frick’s hirelings. When the boat got within range, the Pinkertons had opened fire, without warning, killing a number of Homestead men on the shore, among them a little boy, and wounding scores of others. I can say as clearly as possible that under no circumstances will we have any further dealings with the Amalgamated Association as an organization. This is final. The workmen in the Amalgamated Association work under what is known as a sliding scale. As the price of steel rises, the earnings of the men also rise; as the prices fall, their wages also fall. The wages are not allowed to fall below a certain amount, which is called the minimum. Until now, the minimum has been $25 per ton of steel produced. We have recently changed the minimum to $23 instead of $25. We believe this is reasonable because the Carnegie Company has spent a lot of money on new machinery that allows workers to increase their daily output, and therefore increase their earnings. The Amalgamated Association was unwilling to consider a minimum below $24, even though the improved machinery would enable workers to earn more. We found it impossible to arrive at any agreement with the Amalgamated Association, so we decided to close our works at Homestead. The Amalgamated men surrounded our property and blocked all of the entrances and all roads leading to Homestead. We felt that for the safety of our property, it was necessary for us to hire our own guards to assist the sheriff. We brought our guards here as quietly as possible; had them taken to Homestead at an hour of the night when we hoped to have them enter without any interference whatever and without meeting anybody. All our efforts were to prevent the possibilities of a confrontation between the Amalgamated Association and our guards. We have investigated and learned that the Amalgamated men and their friends fired on our guards for twenty-five minutes before they reached our property, and then again after they had reached our property. Our guards did not return the fire until after the boats had touched the shore, and after three of our guards had been wounded, one fatally. 1.) How does Emma Goldman describe the men of the Amalgamated Association of Iron and Steel Workers Union? 2.) How does Emma Goldman describe the Carnegie Steel Company? 3.) How does Emma Goldman describe the Pinkerton Detectives? 4.) How does Emma Goldman describe the Homestead Steel Mill Strike? What words or phrases does she use to convince people of her side of the story? 5.) How does Henry Frick describe the men of the Amalgamated Association of Iron and Steel Workers Union? 6.) How does Henry Frick describe the Carnegie Steel Company? 7.) How does Henry Frick describe the Pinkerton Detectives? 8.) How does Henry Frick describe the Homestead Steel Mill Strike? What words or phrases does he use to convince people of his side of the story? 9.) How are Goldman and Frick's claims about the Homestead Steel Strike alike? 10.) 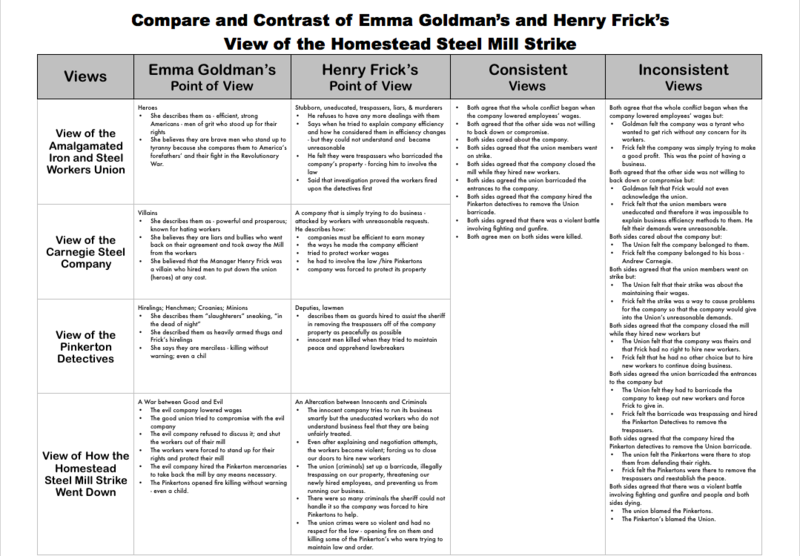 How are Goldman and Frick's claims about the Homestead Steel Strike different? 11.) Whose claim is more believable? Why? Below is the Compare and Contrast Chart that we did in class. You can click on the link to open the document or use the image below. 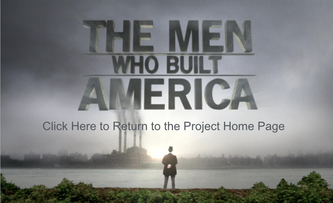 Directions: You have completed the Episode 4 Lesson of the Men Who Built America Project. Click on the icon below to go back to the Project Homepage.